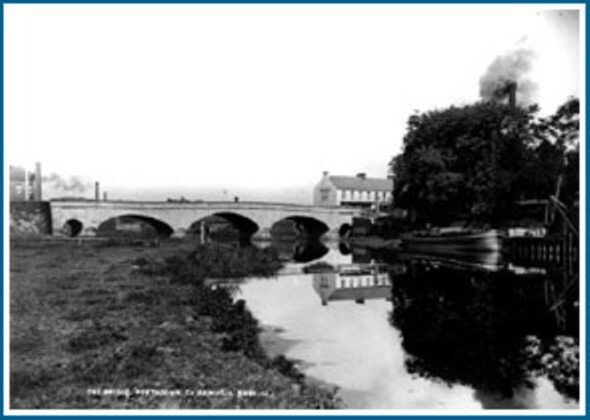 Portadown, which means 'landing place of the ferry' from the Irish 'Port an Dúnáin' has it's beginnings in 1610 when James 1 granted 2000 acres of land at Ballyworran (Ballyoran) to William Powell of Staffordshire. In 1611 Powell sold the land to the Reverend Richard Rolleston who then sold it to Richard Cope of Loughgall. Cope divided the land with Michael Obins who secured the land, which runs down to the west bank of the Bann. By 1619 Obins had built a house of brick and lime along with a bawn or fortress and by 1622 had settled 30 scattered English families'. He died in 1629 and was succeeded by his son John who with his mother Prudence, secured a patent for fairs and markets in the town in 1632. Markets were then held every Saturday with a fair held on All Saints' Day and another at Pentecost, later another fair was held on Easter Monday. 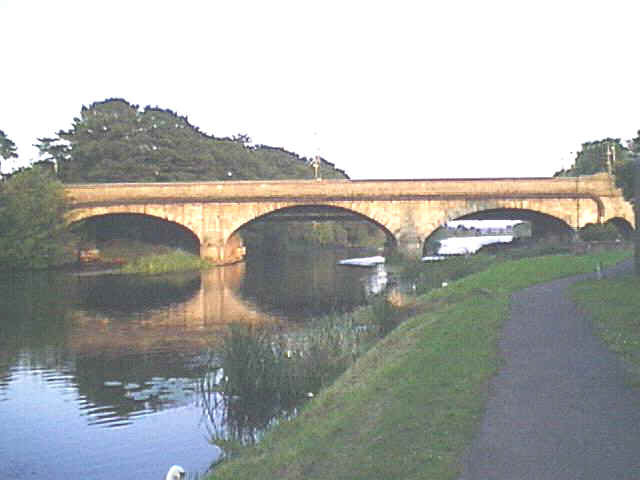 The opportunity for trade offered by these together with the building of the first bridge over the River Bann opened the way for commerce and prosperity in the town. Under Mary I and Elizabeth I plantations took place in Leix/Offaly and parts of Munster, but Ulster remained largely outside the control of the Crown of England. Elizabeth tried sending English armies over to Ulster to check the power of the Ulster chieftains. The chieftains, led by Sir Hugh O'Neill, rebelled and this resulted in the nine years war which began in 1594. Even though the chieftains had rebelled against the English crown, when they surrendered in 1603 the King of England at that time, James I, allowed them to keep their land. However, afraid they would be falsely accused and imprisoned, some of the Ulster chieftains fled to Spain and other Catholic countries in Europe. This happened in 1607 and was called "The Flight of the Earls". The Ulster Plantation had financial advantages for the King of England, James I. For instance, instead of paying former soldiers or servitors who fought in Ireland with money, he would reward them with land in Ulster. There was another benefit to giving the land to settlers. The king would not have to pay soldiers to protect the land because the settlers could build defences such as bawns and protect the land for themselves. The King could actually extract rent from the soldiers and therefore he could make even more money out of the plantation. Another man who benefited greatly from the Ulster Plantation was Sir Arthur Chichester. Already an important landowner by 1607 in the area around Belfast, he acquired land belonging to Hugh O'Neill around Dungannon. The Plantation of Ulster happened in 1611,after the flight of Earls in which the main Ulster Gaelic chiefs, the O’Neills and O’Donnells fled to the continent. The English Government has spent 9 years (1594 -1603) and a lot of money reducing the Gaelic chiefs of Ulster to submission and they were intent on insuring it would not have to be done again. The natives were driven to the bogs and the moors where it was hoped that they would starve to death. The solution was to remove the natives from their land and replace them with English and Scottish settlers. The scheme included 6 Ulster counties The Plantation is an event that echoes to the present day. In North-east Ulster it planted very deep roots and within a generation many parts of NE Ulster were as English (and Scottish) as the land the settlers had left. as a way to eradicate Scotland of the hordes of Lowland and Border Scots, many of whom in their desperate poverty felt compelled to turn to a life of marauding and horse thievery, which had become an occupation in itself in the Scottish countryside. Many were hardscrabble, subsistence farmers barely able to support their families. Hence in the early years of the Plantation, the majority of the settlers were Lowland and Border Scots seeking a better life. I recently was past the old Mill and these are the best shots I could get. The whole place is now boarded up since the Mill closed about 3 years ago. I also enclose a photo of Kenny and me with Linda in Washington. We had a wonderful afternoon and evening with Linda & Steve. The fields immediately behind the mill belonged to Vallentine and the document in PRONI where the Seal was affixed, related to the water rights which helped this Mill progress in the early days. I was speaking with our Researcher Tom Gribben in Dromore last week and he tells me he has been trying to trace the document where the SEAL was, I thought it was so easy to find, but John - you could send me the reference for it. I know I have it somewhere, but papers are a bit mixed up at present. Tom has been reading through the Blacker papers, but they show nothing of Hollingsworths at all, but then they date from later times. I had suggested the other papers from the original Landlord, but so far there is nothing happening there. Tom plays bowls on a Thursday evening, and that is late night opening in PRONI. He will finish this League soon, with summer bowls finishing, and will be able to concentrate more then. He will then be able to give an idea of the price too - he will not fleese you - I'll make sure. I think for the October Trip we would have his company down in PRONI for those who wish to know or feel their way round the records. Tom is a minefield of information. Just another extract from CRAIGAVON MUSEUM HISTORY::::V Hollingsworth's 100 acres was purchased from Richard Cope.